Yesterday I walked for seven miles in the sweltering heat. I didn’t have to do it. I didn’t particularly want to do it. But I was compelled to do it. I suppose you could either call it a kickstart to my new healthy lifestyle, or you call it repentance for the feast of local foods on Saturday at Empire Farm. Whatever you want to call it, the sweating felt good. I made sure to stay hydrated, and even turned the excursion into a work project. On my walkabout, I made sure to take pictures of local businesses that were photoless on Yelp. So in that sense, not only was it healthful, but it was also productive. Perhaps part of my new exercise strategy should be to go on a “yelpabout” every week. I don’t know. However, I am certain about what compelled me to go on that urban hike. The food at the FarmOn! Foundation’s Hootenanny was incredible. I’m not going to give you the play-by-play, but I will share some culinary highlights along with a few things I learned. Here’s a picture for the cheese geeks out there. I really hope Eric Paul sees this, because it’s incredible. Old Chatham Sheepherding Company was there sampling cheeses. But the most remarkable thing was the juxtaposition of a young Kinderhook Creek and some small aged ones. As you can see, the aged mini wheels had their tops cut off, and were so ripe that they were filled with a luscious scoopable paste. The cheesemaker had no idea who aged these cheeses, but whoever conducted this labor of love should be put on a pedestal and showered with praise. I also got to meet Marianne from The Hudson Standard. She makes shrubs and bitters, and I got to try her wares. Man, those shrubs were tasty, well balanced syrups of apple cider vinegar, local fruit, and sugar. I would have bought a bottle, but I knew Mr. Dave would never stop laughing at me. So instead, I’m now inspired to blend up my own batch. What I did buy was a bottle of their ginger bitters. The celery bitters were also excellent, but ginger plays better with the drinks I tend to make. Derek from Harvest Spirits was also there, and he’s now making apples into vinegar too. It was good to catch up with him, but I do really need to make it out to the distillery soon and have a proper visit. Since I was driving, I didn’t partake in his samples, but I couldn’t resist a few sips of Hillrock’s bourbon, rye, and single malt whiskey. We really are lucky to have so many talented distillers in the region. Mostly I wanted to see what chef Jonathan Wright of the Rainbow Room would do with all this local bounty. This is the food I want to eat. And this is the time of year to do it too. Most dishes seemed very simple, but the flavors were huge. Roasted red peppers are nothing new. But these smoky barbecue-roasted red peppers with pistachio creme fraiche on thyme crostini are a game changer. Grilled peaches with sliced country ham, radicchio, goat cheese and blackberry vinegar lights up the entire palate with sweet, bitter, smoky, salty, tangy, and creamy elements. Plus it’s a delight for the eyes as well. But my favorite plate of the whole night was the wood oven roasted fennel, on a bed of stracciatella, seasoned with preserved lemon, and topped with slow spit roasted lamb (plus a little bit of arugula). Wow. The flavors and textures of this dish still linger in my memory, and I hope they never fade. I would gladly drive down to NYC and pay any price to have this again. Which isn’t to say that the whole roasted Berkshire pig from Sir William Farm wasn’t excellent. It was. Especially the crusty end bits with plenty of chimichurri. It should also be noted that the fried chicken with smoked bacon waffles and chipotle mustard maple syrup raised the bar for this increasingly ubiquitous dish. And honestly, that’s only a fraction of what I ate. There were two desserts. As good as they both were, the Ronnybrook Farm creme fraiche flavored with vanilla and hyssop stole the show. Even the coffee from Irving Farm Coffee was excellent. I took a copy of the menu home with me, because there are so many farms on there that up until now have been entirely off my radar. Angelo Mazzone was there too, and that’s a good sign. He’s helping to build a teaching kitchen at Empire Farm. That’s a good first step. Maybe we’ll see him pushing more of this ethos in his restaurants soon. Congratulations to Tessa and her team for pulling off an excellent and inspiring event. If you weren’t able to attend, and want to learn more about the FarmOn! Foundation (plus how to donate) here’s the link. The foundation is doing great work, and I’m going to enjoy watching it grow. 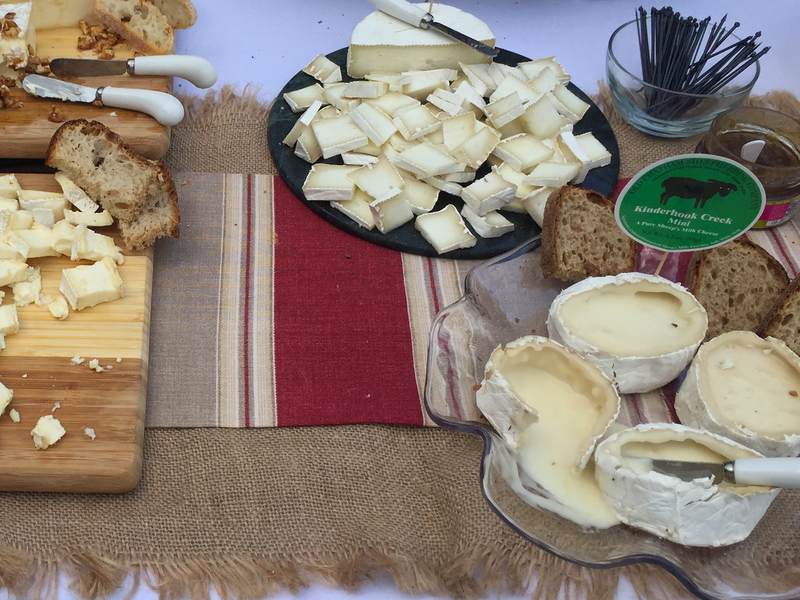 I had a taste of the same super-ripe wheels of cheese last week at an event and they were amazing. And your mention of a grilled peach dish inspired me to make a grilled nectarine dish with similar ingredients. I prefer nectarines to peaches because they are so juicy and sweet/tart while having a tighter and more concentrated flavor and texture then peaches. East Coast nectarines are now in season and I usually eat them just as-is but I purchased more then we can eat as-is. Grilling really intensifies the flavors.